Samsung Electronics is launching the Samsung Connect Tag – a new way to keep track of the loved ones, valuables and all the matters in life. Furthering Samsung’s commitment to a seamless IoT experience across devices, the Samsung Connect Tag will be tied to the SmartThings ecosystem, working in conjunction with the user’s smart home appliances through Works with SmartThings. The geo-fence feature on the Samsung Connect Tag will notify the user’s chosen smart devices when he or she approaches – so if the user wants lights and TV to turn on while getting home from a nightly run, the Samsung Connect Tag can trigger these products as the user enters the pre-define zone, so the user will get a notification when the child enters the schoolyard or a dog jumps the backyard fence. The Send my location function will send their current location to their guardian, so even a young child can let you know exactly where he or she is and can go pick him/her up safely. Additionally, periodic location notifications will show a trace the loved ones location record. Connect Tag features a compact size, measuring just 4.21 centimeters wide and 1.19 centimeters thick, as well as IP68 water and dustproof rating for durability. The battery can last for up to seven days on a single charge, minimizing the need to constantly swap out or plug in the device. 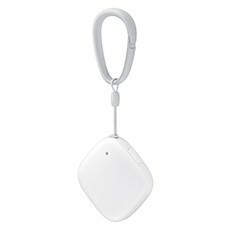 Connect Tag comes with an exclusive ring that easily attaches to bags, collars or key rings. Connect Tag will be showcased at the Samsung Developer Conference 2017 on October 18-19 at Moscone Center in San Francisco, California, United States. It will be available for purchase starting in Korea before expanding to select countries in the coming months.